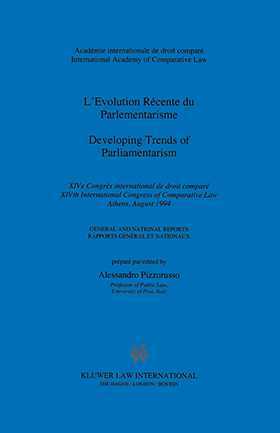 This volume contains nine national reports and the general report on the subject of Developing Trends of Parliamentarism. Except for the chapters on Spain, the reports have been written for the XIVth Congress of the International Academy of Comparative Law which was held in 1994 in Athens, Greece. `Parliamentarism' describes the evolution of a specific form of Government adopted by many countries whose political systems have been inspired by the principle of democracy. As a consequence of this, one or more elected assemblies hold a leading position in their constitutional organisation. Both the general report as well as the national reports address the current problems regarding parliamentarism, viz., the structure of Parliaments, the ways regulated and the delimitation of the functions of Parliament with the aim of maximising its orientating function in the activity of its citizens through a constant updating of existing legislation.